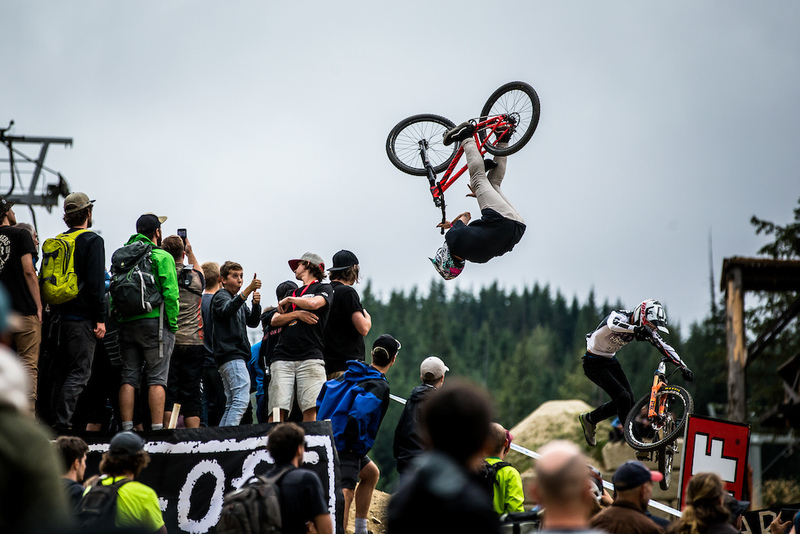 I’m hyped to be in Les Gets – the French fans always know how to turn up the stoke! But once again, I have to take care of business. 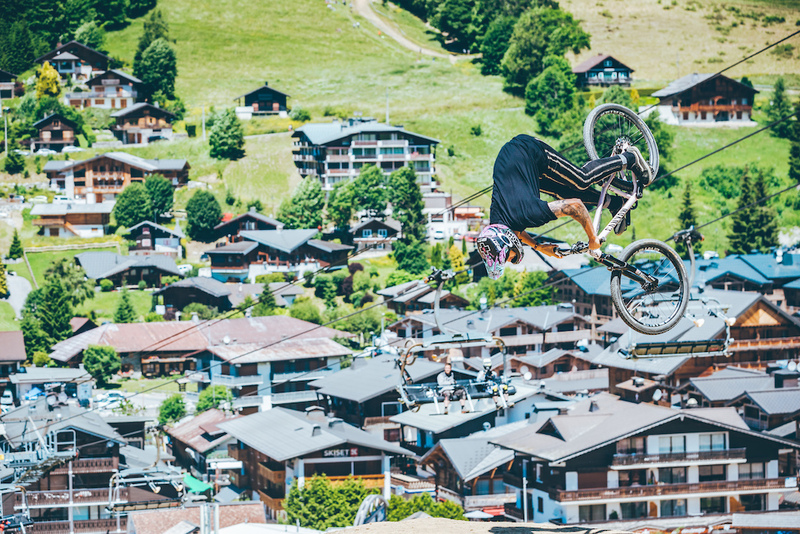 No Speed & Style for me this time though – it’s on the same day as the Slopestyle finals. 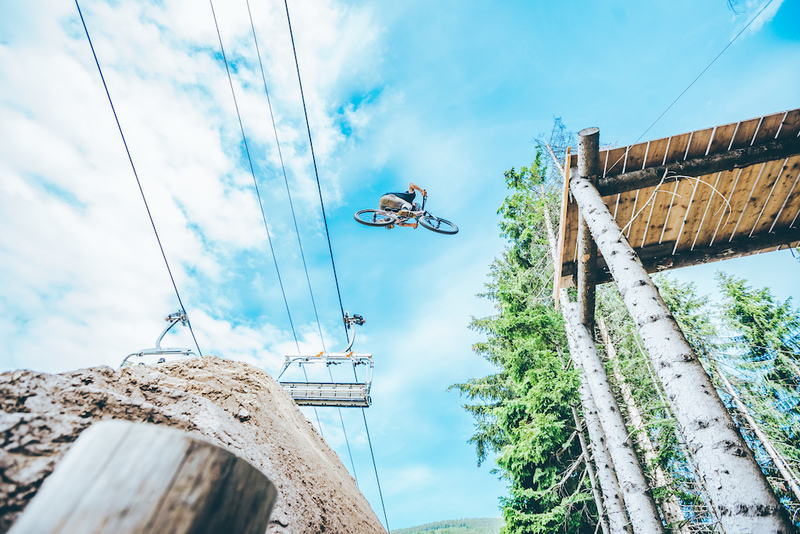 This time, it’s only about Pumptrack and Slopestyle, so the week is a bit more chill than the one in Innsbruck. 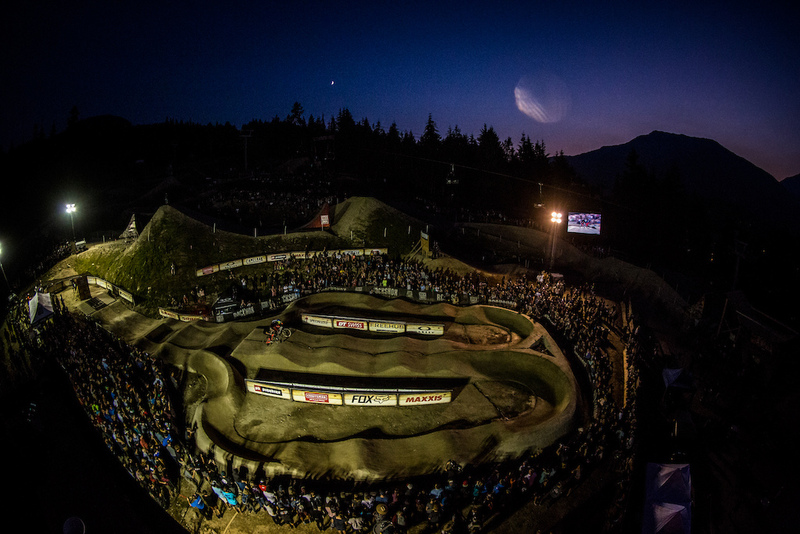 Racing Pumptrack under the lights is always insane! Speeding through the track I manage to get the drop on guys like Tomas Slavik and Martin Lebl. I’m feeling better here than I did in Innsbruck and it shows – I battle hard against Luca Cometti, who’s been fast all night long, and I make it into the finals, where I face off against Keegan Wright. This guy is a whirlwind on the track. The final is super close, but Keegan beats me in both runs – by 0.05 and 0.11… Can’t say I’m not disappointed, but it was a close battle to finish line, so I’m alright with second place. 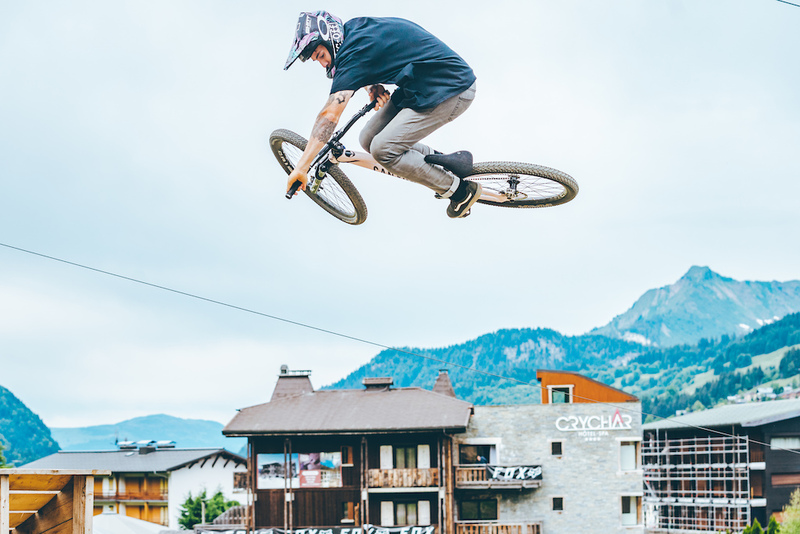 There are a couple days in between Pumptrack and Slopestyle at Les Gets, so there’s a lot of time to work on my run, but unfortunately the weather has other plans – it’s pretty windy, so our practice time is pretty limited. I get runs in when I can, but all the boys are talking about how they really just want a solid, long session. Finally, the wind dies down and we can ride. It’s time for some last-minute practice but unfortunately, it didn’t go my way – I hit the stepdown alright, but the second feature caught me out and put me on my face. My hand hurts, but I’m still going to ride finals… maybe I only do one run, we’ll see. I watch Erik Fedko throw down a heater of a run before dropping in. This kid is going places! Huge tricks, awesome flow. Podium player for sure! I’m still not sure whether I’m doing two runs, so I have to go all out for the first one; 360 Barspin on the Stepdown, Backflip Double Barspin on the first jump and a 360 Inward table to Barspin on the second jump – man, I love that trick! 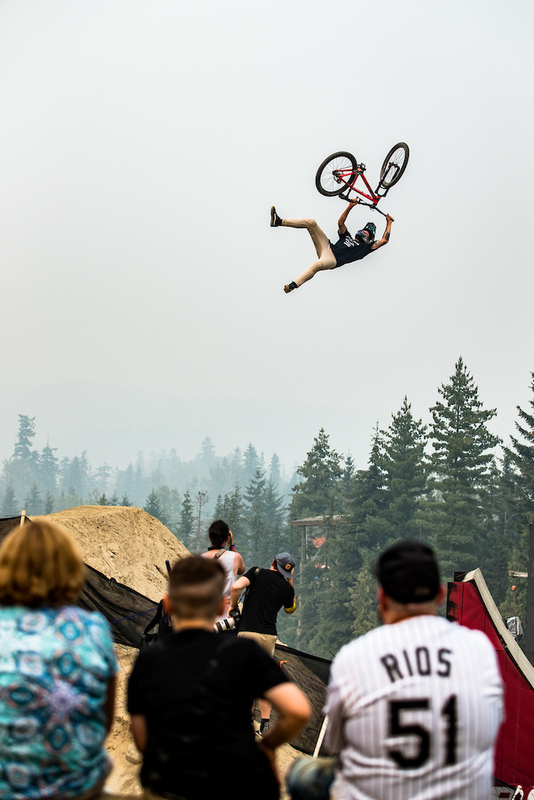 Landing that has me amped up, so I go for the Frontflip onto the whale tail and a 360 Double Barspin off. Riding up toward the lip of the, I pull a Backflip Tuck No-Hander to Barspin. Stoked with that run. 84.00 Points and I’m amped up, so I go back up top for my second run after all. 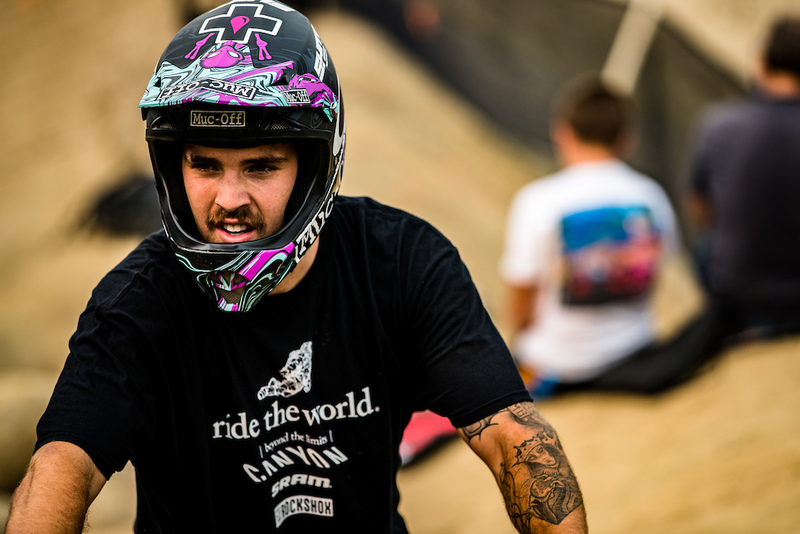 I go for the Backflip Double Whip on the second jump, but land sketchy and slip a pedal. I know I won’t get the speed for the next jump, so I pull onto the Speed & Style track to race down the mountain and roll onto the final jump, thanking the crowd for the support. 84.00 will have to do. 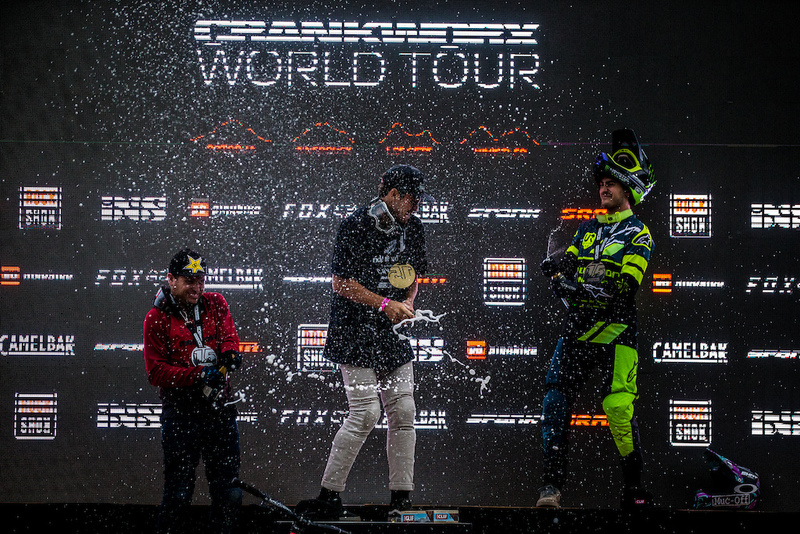 Another 4th place for me – I definitely need to get that podium spot, but I’m stoked for Erik! I see Erik take a victory lap – with only Nicholi and Brett left at the top, he is guaranteed a podium spot! The battle between Brett and Nicholi continues, but Brett is unable to improve his score so Nicholi takes the win, making it two in a row. 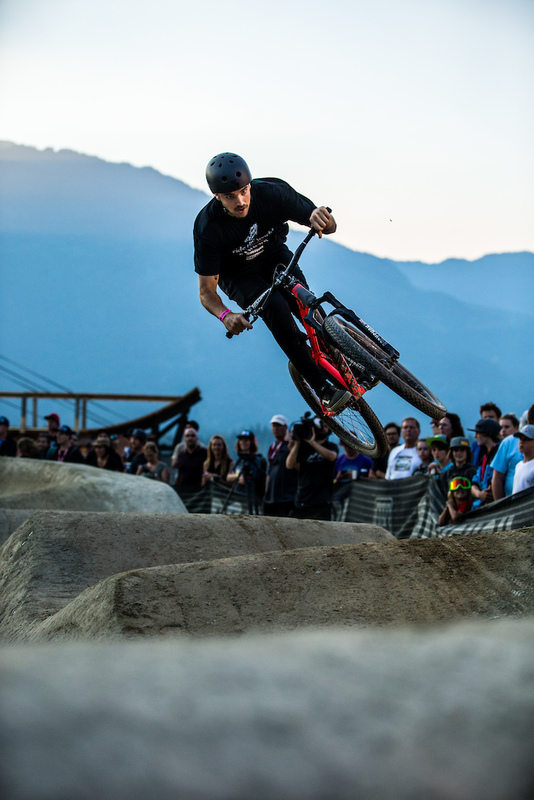 Crankworx Whistler is another busy one for me – Red Bull Joyride might be the big show, but I’m also competing in Speed & Style and Pumptrack before riding slope. 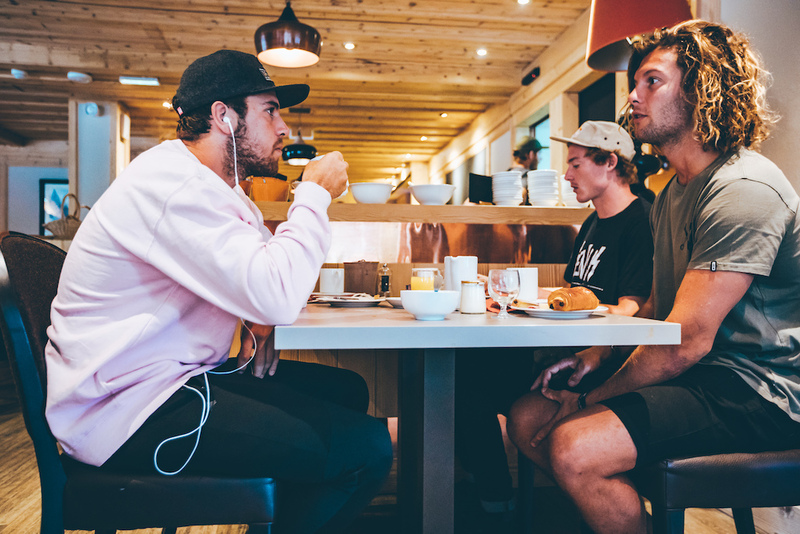 I’m really surprised when someone tells that my results across Slopestyle, Pumptrack and Speed & Style currently have me sitting in second place in the King of Crankworx ranking, just a few points behind Sam Blenkinsop. I had never thought about it and was completely oblivious. I take it as extra motivation going into Whistler, but ultimately I already know, that I have no chance to beat Blenki. 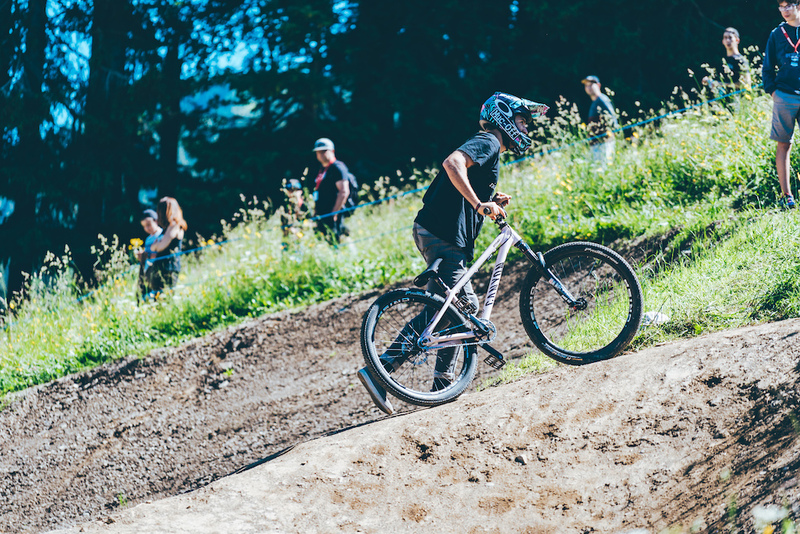 There are several DH events, all of them count towards the King of Crankworx and Blenki is pretty much guaranteed a Top 10 or even Top 5 in all of them. 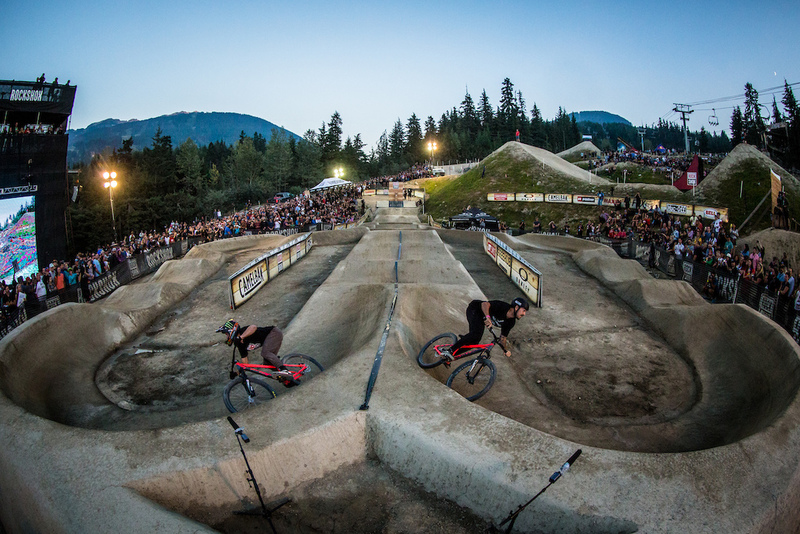 ‘Only’ riding three events in Whistler, I know that I won’t beat him but that doesn’t mean I have to make it easy for Sam. Speed & Style is a battle every time because there’s always some big dogs in the mix and this time it’s no different. 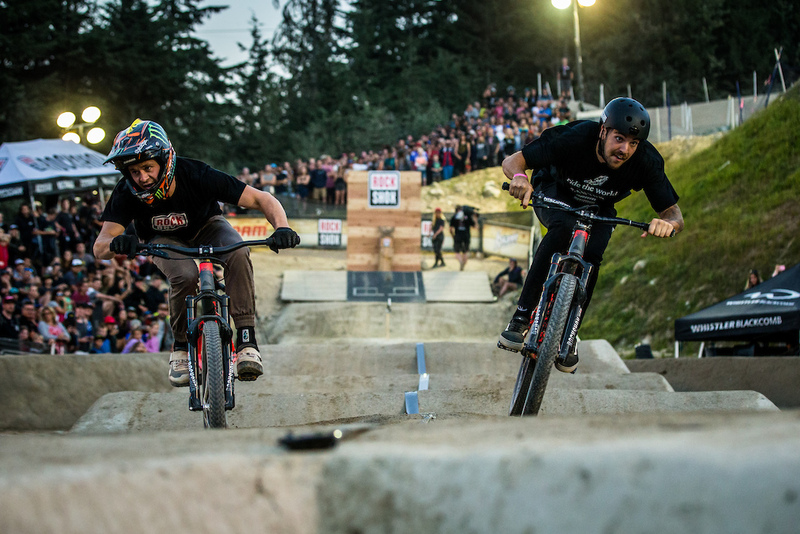 I race against Liam Wallace, Bas van Steenbergen and Tomas Slavik on the way to the semifinals where I meet Sam Reynolds once again. Reynolds blasts out of the gate in the first run, but we’re even by the time we get to the double. I just landed a Backflip Double Barspin and get some good speed coming into the berms. I overtake him ahead of the second set and land a 360 Double Barspin on the second jump, giving me a massive speed boost to cross the finish line first – I’m over a second up and nailed my tricks, so I should be ahead, but let’s see… The score comes in and I’ve got a big lead over Reynolds; looks like he got some penalty points for clipping a flag. Honestly, that gap is huge, so we laugh about it. If you don’t believe me, just watch the replay. Time for the second heat! 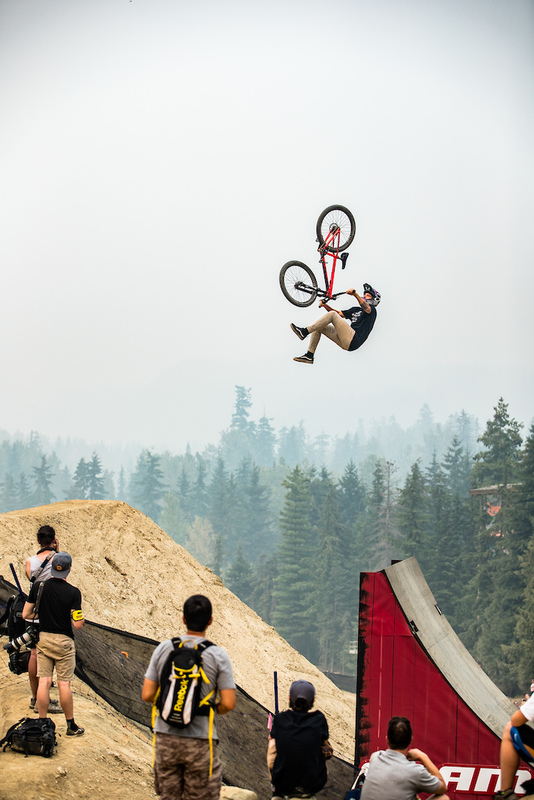 Reynolds goes for the Flipwhip on the first jump to equal out the score gap. That trick definitely beats my Backflip Double Bar on a normal day, but I hear him case, so I take a quick look back to see if he’s ok. I dial it back to play it safe and he overtakes me ahead of the final jump and straight airs it, while I pull out a 360. I get to the finish behind Reynolds. We congratulate each other and wait for the scores – I definitely didn’t score super high in that run, but the gap is huge, so I think I got this. Reynolds gets a 50-point deduction for that straight air and I was still pretty close to him speed-wise, so I go through to the finals to race against Greg Watts. We both send a Backflip Double Barspin as our first trick and Greg gets ahead of me. I mess up on the corner going into the second jump, so I lose more speed, but I still get the Double Truckdriver on the second jump. I cross the finish line 1.40 seconds behind Greg and we’re pretty even on tricks – Greg is even scored 5 points higher, so it’s all or nothing in my second run! Second heat starts and I’m in the fast lane. I get the snap on Greg out of the gate and we both go for the Flip Double Bar again. I get some more speed and I’m out of the corners first. This is where it counts, so I pop the Double Truck Driver again. Not sure what Greg landed as I’m gunning it down to the finish line. I’m up by 1.46, so let’s see the trick score! Greg and I talk about our run and he tells me he thinks he clipped a gate. I catch my breath as we wait for the scores to come in! I get double 90s, just like in my first run, and Greg gets a 40 for his second trick, so the gold is mine! I have a few days before racing Pumptrack, so I get my practice laps in and do some big bike riding. 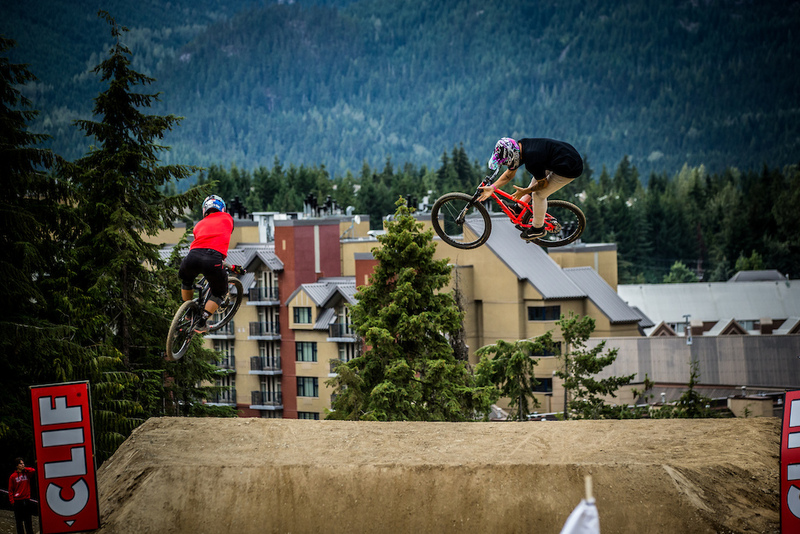 Can’t go to Whistler and not ride the park! Then it’s time for some Pumptrack under the lights. I’m up against my Canyon teammate Troy Brosnan in the round of 16 and if there’s one thing that Troy is, it’s fast! Troy and I are pretty even during the first heat, but he sneaks ahead of me right before the finish. That was definitely one of the closest races I’ve had this year, but I’m only 0.07 back, so I know I can get this race back in the second heat. I’m pretty nervous though. I had a very quick start in the second heat. Keeping my speed up, I time my pumps right and come out of the turn ahead of Troy. I cross the finish line 0.15 seconds ahead, so I’m on to the next round! Troy and I exchange a high five and I get some props from him. Micayla finds me again between races and we do a quick interview. She tells me that I can still beat Blenkinsop if I win here tonight and do good during Joyride, but I’m taking it one run at a time, focusing on the next race, rather than the whole week that’s still ahead of me. Still wish Blenki good luck though…at the end of the day, the bike world is a pretty close group! I’m racing against Michael Bias again in the next round and squeeze ahead on both runs, I’m starting to feel better now, a little less nervous, but there’s still some fast guys out here. 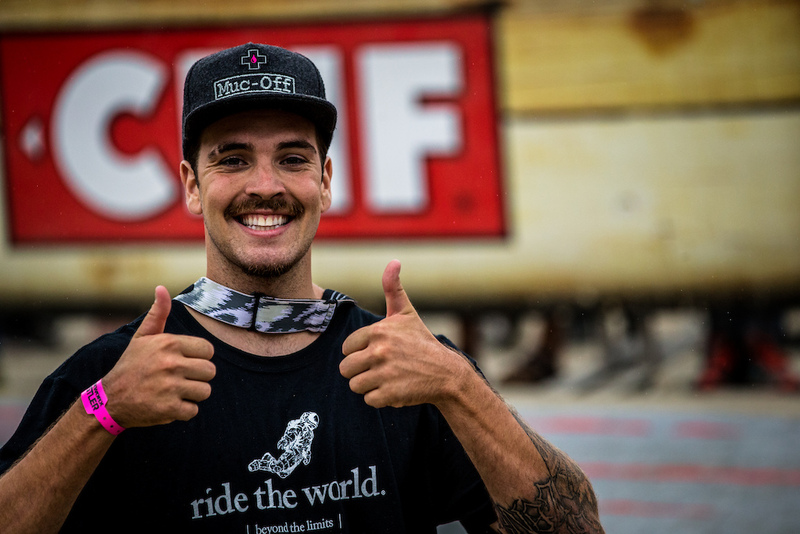 In the semi-finals, I’m up against Chaney and Micayla tells me that if he wins, he gets the overall Pumptrack trophy but if I win, I go home with it. Let’s see what happens! I beat him in Rotorua, but he’s a strong racer, so it’s all still wide-open. I have one more chance to still get a podium finish – and I need to beat Keegan Wright in the small final to make it happen! I clear my head and don’t think about what just happened. I fire out of the gate and push through, but once again, I’m down by 0.06. Time to go big or go home in the second heat! I’m ahead through the first section and push hard to get some more distance between Keegan and myself. I gun it down the final straight and hit the last roller. The moment I cross the finish line, I look back at the clock. I’ve done it – 0.20 faster, so I’m on the podium. Phewww. I’ve got a full day of slope practice ahead, so I take it easy for the rest of the night. 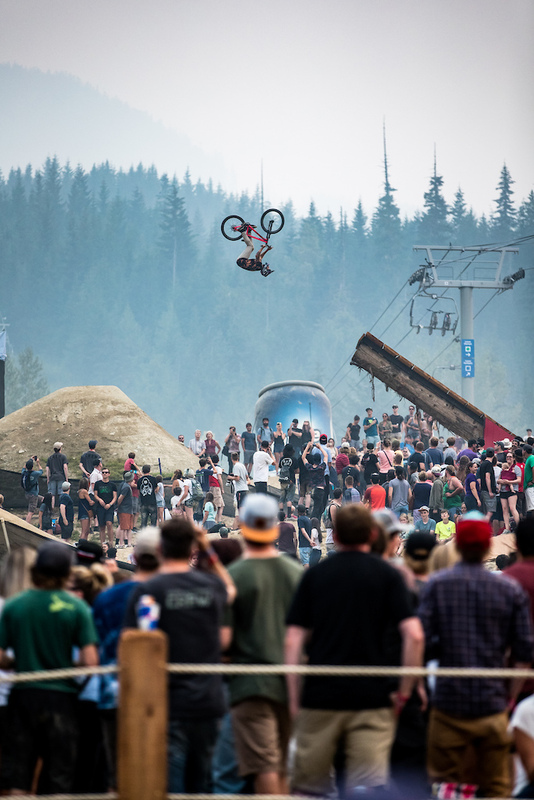 Time to focus on the big show, Red Bull Joyride! Practice definitely didn’t go my way and on finals day, I still felt the effects of a huge crash in the morning, but had to keep riding to get my run dialed. Definitely not my best run but I know I was pushing to get a high score. I over-rotated the step-down and slipped a pedal on the Backflip Double Tailwhip which cost me some major points. My score comes in and it’s a 65.50… Looking back, I probably should have done a chill run first and put down a good score instead of messing it up and having to go all out in my second run. My second run starts off really well and I throw my favorite trick - a 360 Inward Table to Barspin but I mess up the Flip Double Whip again and then spin too far coming off of the whale tail. I know this contest is over for me. 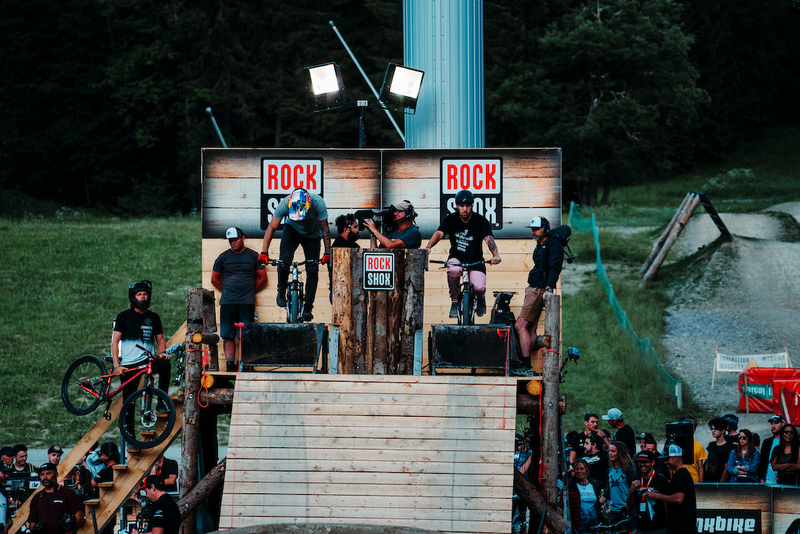 I roll into the finish corral and I just hang my head – this probably cost me my third place in the overall… Pretty bummed, but I hang around to check out the other runs, and watch Nicholi stomp his run and finally win the Triple Crown of Slopestyle… wow! 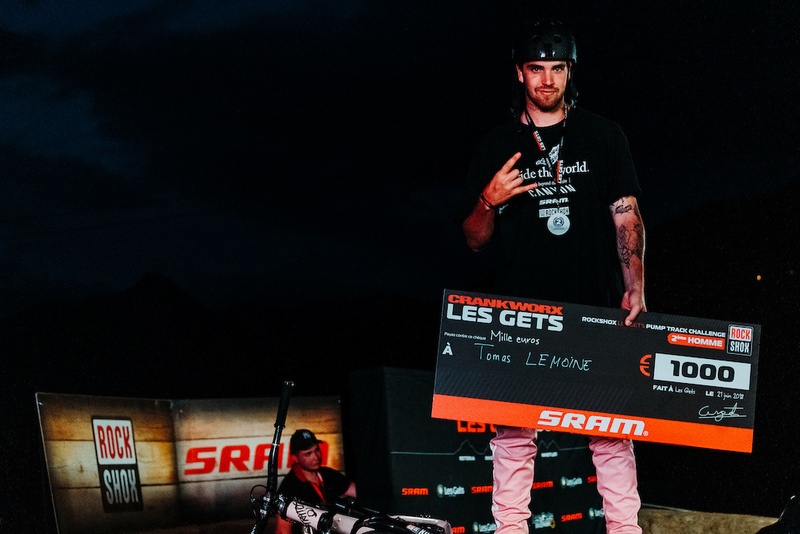 I’m heading back home to France with a 1st place in the Dual Speed & Style World Tour Ranking, a 2nd place in the Crankworx Pumptrack World Tour Ranking and a 2nd place in the King of Crankworx ranking. 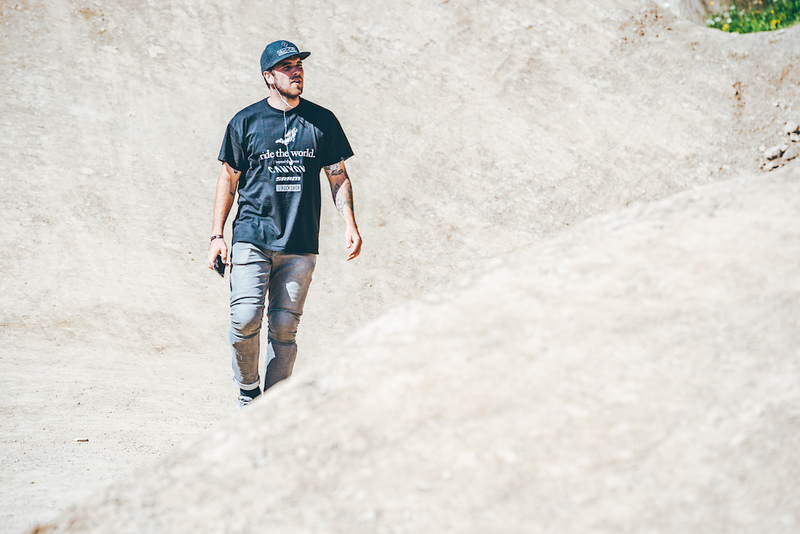 It’s been a really good season and considering that my focus was on slopestyle, I’m stoked with the results in Pumptrack and Speed & Style! I’m also 4th in the SWC standings, so I’m pre-qualified for all events next year! 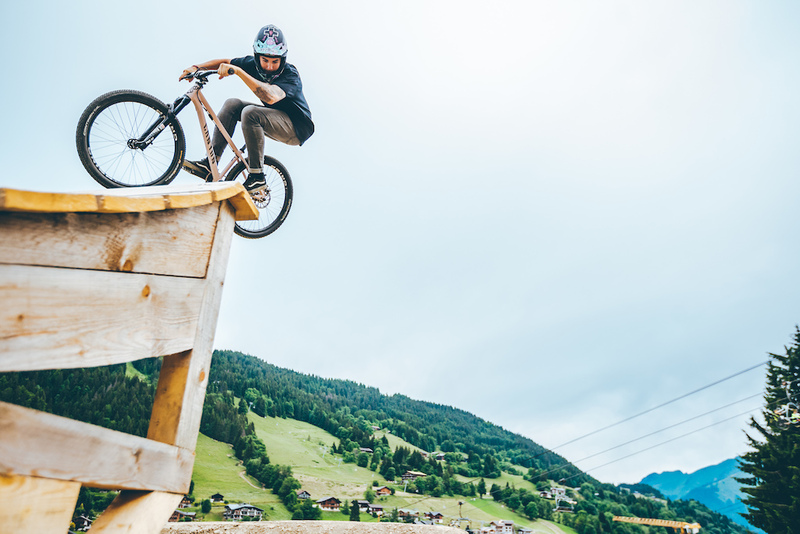 I definitely need to get that Slopestyle podium in 2019 though, so it’s time to put in some work! Tomas rips. 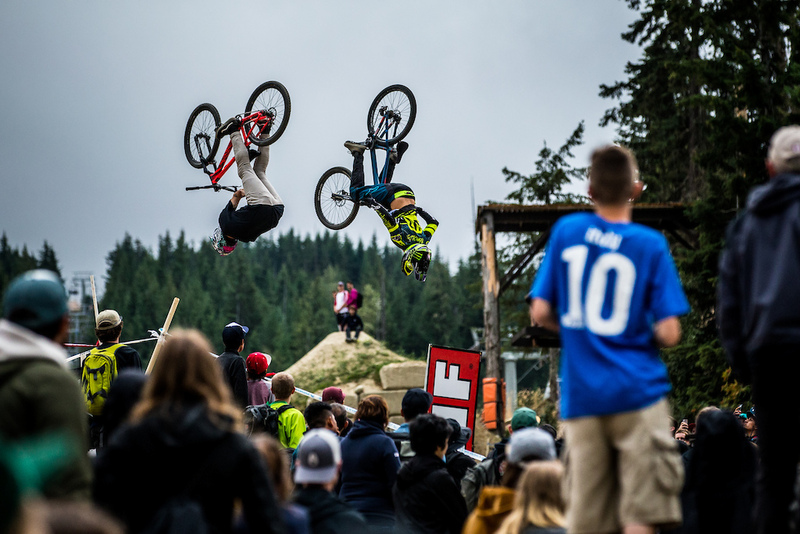 Cant wait for crankworx to kick off!